I’ve been cooking a lot, which is amazing. Means my soul is definitely happy. Lots of good things happening and lots of great things to look forward to. Life is good to keep it simple, but really, when isn’t life good? This is every Monday-Friday without fail. Occasionally we’ll stay later at work if we are in the middle of something, or we’ll go in earlier/later. It really all depends, but for the most part this is the schedule and he’s sticking to it. So my point, it takes some time to prepare dinner & the fact that nothing was done at 4:15pm worried me. I took the bull by the horns and decided I would cook dinner, really had to yank my chain to get me cooking. I looked in the fridge and saw a lot of spinach. The pantry had a can of artichoke hearts & I remembered that we had purchased some chicken sausage the other week that needed to be used. There’s always pasta in the house & everyone in family LOVES spinach artichoke dip. So I stumbled upon a recipe form a blog called A Life of Flavor to use as an outline and see what I could do with it. To be honest, I am still dreaming about this dinner 4 days later. 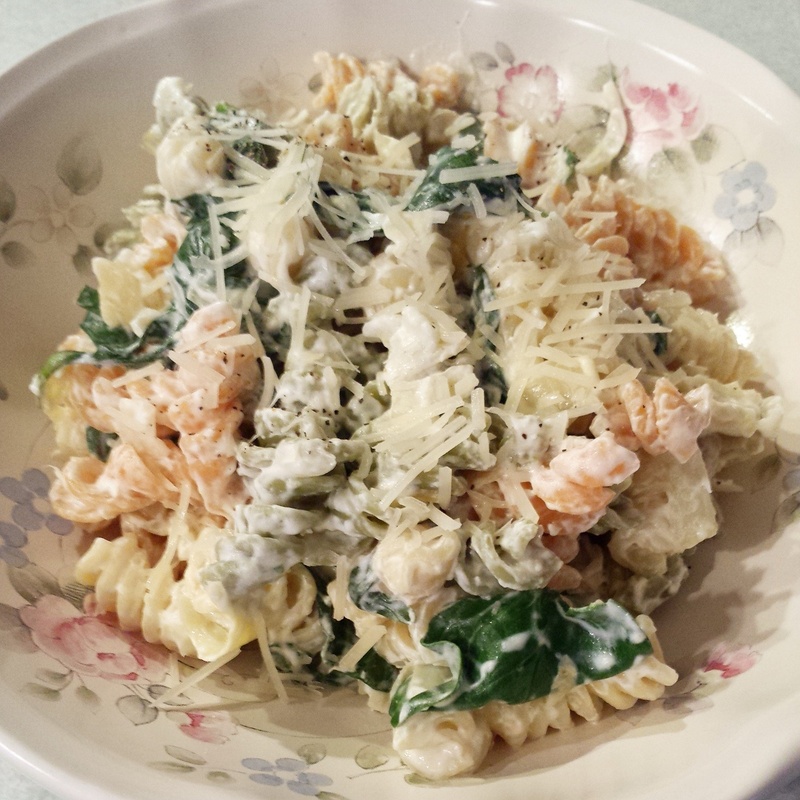 If you’re a lover of cheese, spinach, artichokes & pasta you will absolutely love this dish. It’s really easy & quick to whip up. You will not be disappointed. Cook the box of pasta according to package directions. In a large frying pan, heat olive oil over medium heat. Add diced onions & sliced chicken sausage. The sausage most likely will be fully cooked. Heat until outsides are browned and onions are translucent. Set aside. In a medium saucepan over medium heat, melt butter & add the minced garlic. Add cream cheese and stir until creamy & smooth. Stir in the milk and add the Greek yogurt, lemon juice, salt & crushed red pepper flakes. Once combined and heated through, add the chopped artichoke hearts, baby spinach & shredded parmesan cheese. Drain the pasta & add the artichoke/spinach mix along with the cooked chicken sausage and onions. Top with additional parmesan cheese if desired & ENJOY!